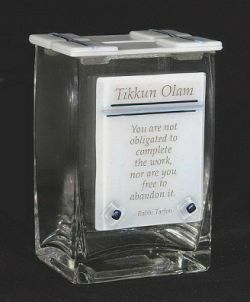 The words of Tikkun Olam adorn the front of this glass Tzedakah box with fused dichoric glass. The lid lifts off to retrieve the money. A perfect Bar or Bat Mitzvah gift.